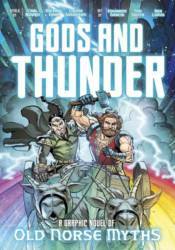 Gods and thunder. Brothers and betrayal. Death and rebirth. Original Viking tales of Asgard, Thor, Loki, Odin, and Baldur come to life in a full-color, action-packed graphic novel format that's perfect for young readers who crave adventure. Prepare yourself for sibling rivalry, ancient prophecies, and epic battles - and enter the weird, wild world of Norse mythology as you've never seen it before!